...and to be honest: If I were Cochrane Cartwright I would not feel to be honoured with such a dram. Slow distillation means that off-notes and flaws are reduced through maximum copper contact time - but this dram is full of off-notes and flaws like rubbery, meaty and other sulphurous notes. It is drinkable, of course - but why should I? The colour is amontillado sherry and the nose offers some rubbery- and meaty-sulphurous off-notes first that are not to my liking at all. Luckily these vanish (to a large extend) after a significant time of breathing (more than ten minutes) but nonetheless: Why should I buy and drink a dram with such a bad first impression (remember: You never get second chance to make a first impression!). After that an average-only modern style sherry nose enfolds without highlights but minor sulphurous notes (that grow stronger upon adding water). The taste is not layered and shows a modern sherry profile with a slightly bitter touch and minor yeasty notes (camembert cheese). All the usual sherry flavours are there in a rather heavy wooden setting. Nothing special to write about except a minor sulphurous impression of spent matches (that is bearable). The initial mouthfeel is just a little warming and almost not coating at all with a minor bitter moment of heavy tannins. The finish is of medium length and turns bitter-drying on tannins and sulphurous notes. Water strengthens rather the unwanted aromas and flavours so add it only if you love such dirty drams. A friendly, uncomplicated dram to drink when you want to un-hurry. Very appropriate for a distillery that advertises with their unhurried distilling, I would say. The combination of first-fill and refill casks worked very well in my opinion, while it has a different taste compared to other releases that I have tried. A good addition to their range and fairly priced (like most of their range). My first impression is the rubbery notes, which (fortunately) dissolves fast into rum raisins, prunes-aux-armagnac, vanilla cakes, and a whole plate of different biscuits. Then some soft fudge. No overt sweetness or bitterness, which I find very pleasant. I also get orange sponge, sweet teas (just a general impression), combined with hints of mint chocolate and Turkish delight. Nice balance and very pleasant nose. A soft entry, well balanced, and a mix of sponges, vanilla, rum, raisin cakes, tangerines, hints of green tea, and a mix of spices. I would say eastern spices, like cumin, curry, and maybe some caraway. This whisky drinks very easily, I have to be fast with my notes or we’ll have a short description! Soft on the tongue like a marshmallow. A mediate finish with a slight soft tannin dryness with cinnamon powder, cherry wood, dried apricots, and cherries. 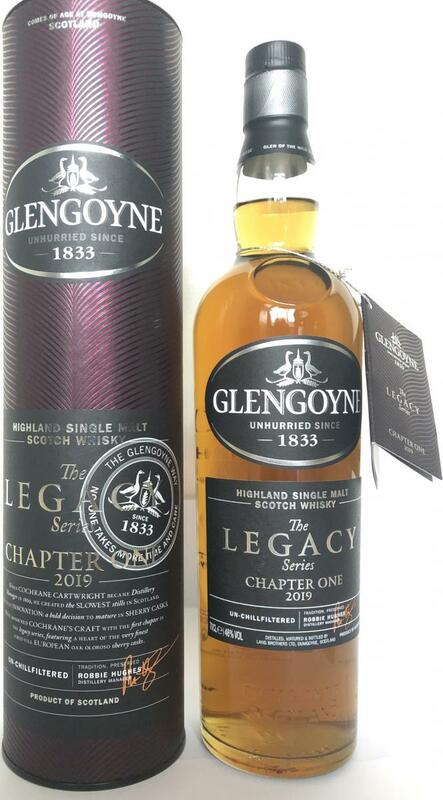 I generally like Glengoyne, but one of the reasons why I like it is that the distillery tends to offer well-aged expressions at affordable prices. This is heading into the opposite direction, with no age statement and a price tag to rival that of the 18-year-old. 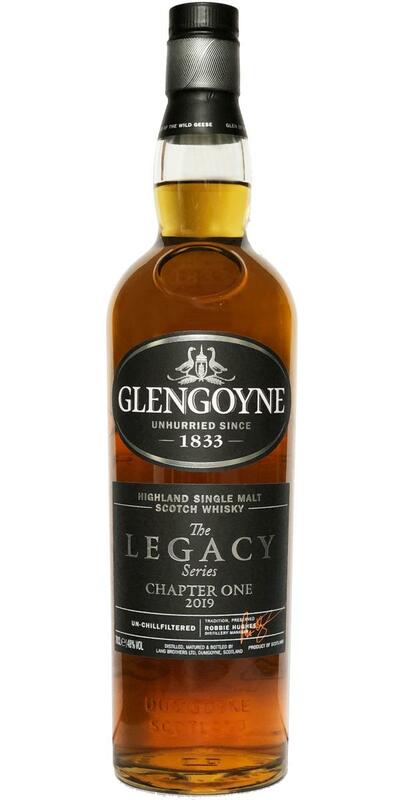 It's a fun dram in and of itself (especially on the palate), but its younger components are too prominent (especially on the nose) to warrant serious interest on my part. Immediately and recognizably young, with some sour, yeasty-fermentary notes. Almost a bit lactic at times. Then there's a distinct berry fruitiness. In combination I'm reminded of wild berry yoghurt. The sherry influence certainly comes through, but for a bottling that places the term 1st fill Oloroso sherry front and center, it's surprisingly restrained and refill-y. The intensity of the sherry aromas reminds me more of recent Glenfarclas OBs than anything else. It's certainly less pronounced than in the 15- and 18-year-old expressions (to say nothing of the 21-year-old). It's rather nutty and sour sherry, no big sweetness: it's Oloroso alright. After a while, an additional citric aspect announces that the (rather young) spirit still has a word to say here as well. As far as the oak is concerned, there's not a lot of it on the nose, and what can be detected is a rather vague sense of spiciness that shades into herbal territories: perhaps some soft rosemary and scattered nutmeg. All in all, pretty simple, youngish and not hugely impressive, though I do have to admit that the fermentary character appears to subside somewhat after a few minutes. Water accentuates the Oloroso notes and is recommended in moderation. Starts off simultaneously sour and juicy, before becoming sweeter and more robust towards the middle. The overall impression is of jammy red berry fruits, and perhaps some sour cherry marmalade. There are (of course) raisins as well as some nice leafy, mossy, forest-y (you see where I'm going with this) sherry notes in here, but they do face off against the youngish, more acerbic components, and it's a bit of a struggle. The mouthfeel is good, however, and at 48%, there's a real sense of some substantial spirit shining through. I might even be tempted to say that it's almost a bit ... chewy? Which is a good thing for sure. So this expression does add something that the core range is missing, and that is an impression of what the distillate feels like at a (slightly) higher strength. And surprisingly, it's rather more weighty than I would have assumed. Almost reminds me of Glendronach or the aforementioned Glenfarclas - other well-sherried Highlanders with meaty, weighty backbones. This is certainly a bit lighter overall, but I'm surprised at the similarities. Definitely fun in the mouth, and there's more going on than the nose had me expect. Dangerously drinkable at 48%, and very juicy. Citrus fruits, marzipine, orange peel, rose fruit, sherry, wood and vanilla. Marzipine, sherry, oak, chocolate, vanilla, sultanas and cherries. Red fruit, oak, vanilla, marzipine, chocolate and pepper.